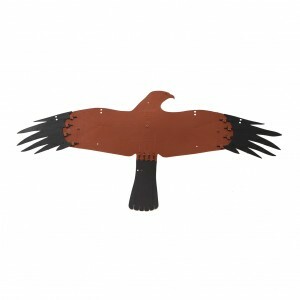 Are perfect for preventing roosting and perching of birds on ledges, rails, pipes, balconies & awnings. Are ideal for pigeons & seagulls as well as smaller birds like Indian Mynas. Are safe - They won't harm birds as they are a passive deterrent. Are cheap and easy to install. Heavy duty UV stabilised polycarbonate - combining the clarity of glass with the toughness of metal. 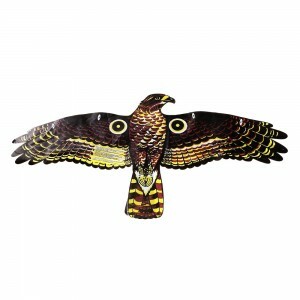 Unique shape & size - Pest X Bird Control Spikes come in 600mm lengths and are easy to cut to size to fit any application. They feature a unique single row of spikes. 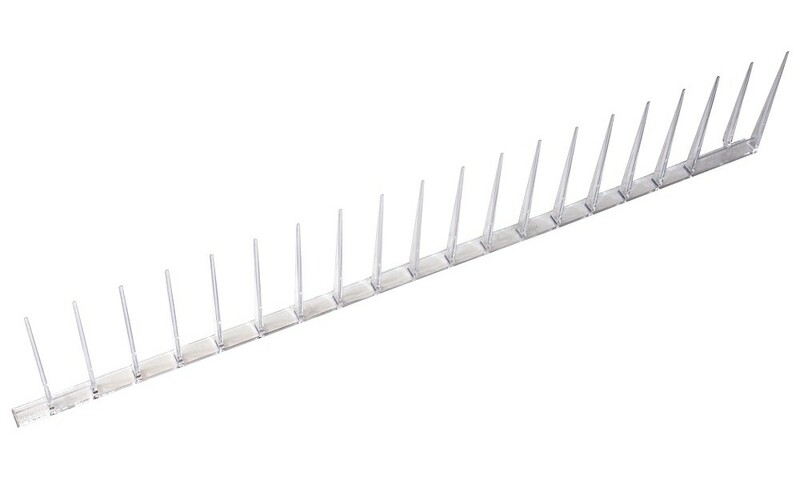 This makes them perfectly suited to narrow ledges and pipes, TV antennas, window sills & fences where other styles of bird spikes cannot be used. 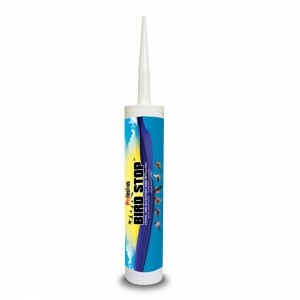 Ease of installation - Pest X Bird Control Spikes can be installed with neutral cure silicone, screwed or cable tied. 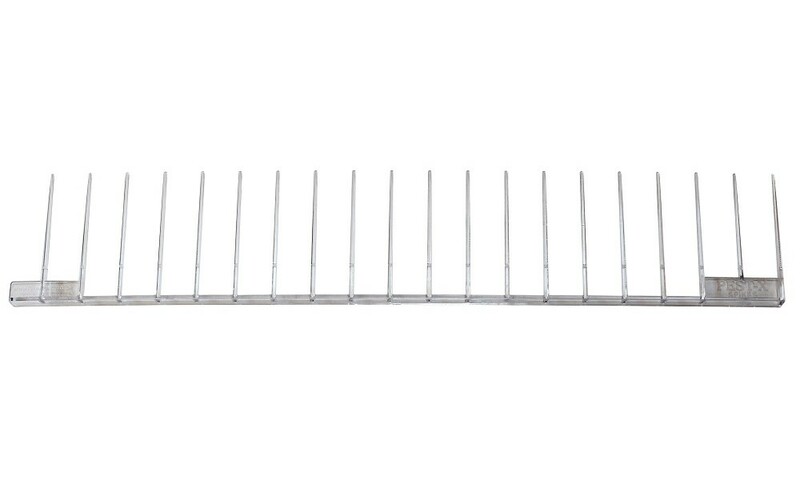 Long term protection - Pest X Bird Spikes can offer over 20 years of protection. 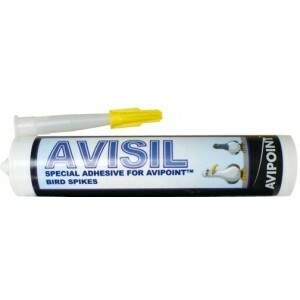 Variety of applications - Can prevent birds from roosting on parapet walls, windowsills, pipes, RSJs, TV Antennas etc. Cost savings - The major advantage of these spikes is the once off initial cost and you get long-term benefits. 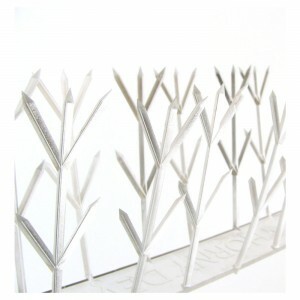 Pest X Bird Spikes are manufactured from polycarbonate, combining the clarity of glass with the toughness of metal. Polycarbonate is UV resistant and will remain stable and does not become brittle like normal plastics. Pest X Spikes are also a useful device to prevent possums and cats climbing trees to access the roof of your building. Pest X Spikes are also a very useful product to help prevent dogs and cats from jumping over your fence to either get in or out of your property. It will help to prevent intruders from accessing your property. Installation is a simple task. All that is required is a pair of snips and neutral cure silicone. These spikes are easily cut to size. Prior to gluing the spikes down the surface must be cleaned of all grease, dirt, bird droppings and other debris. Each row needs to be approximately 90mm apart. 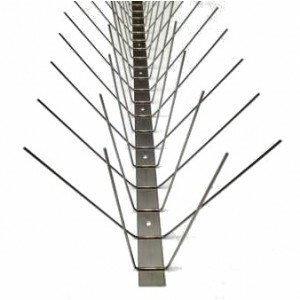 The first row of spikes should be fixed approximately 1.8 metres above the ground and it is important to make sure other trees or structures don’t come close to the tree above the spikes, as the Possum or cat may use this structure to access the tree above the spikes. For bird control on thin ledges, one row of spikes is all that is required. For wider ledges and medium size birds rows of spikes should be glued at 60mm apart. For larger birds such as Pigeons and Seagulls the rows can be glued at 80mm apart. Pest X Spikes can be glued, cable tied to pipes, nailed or screwed. It is recommended before nailing or screwing that pilot holes be drilled into the base of the spikes to prevent the product from splitting. On thin ledges one row is all that is needed. On wide ledges glue Pest X Bird Control Spikes in rows 60mm apart for medium sized birds. 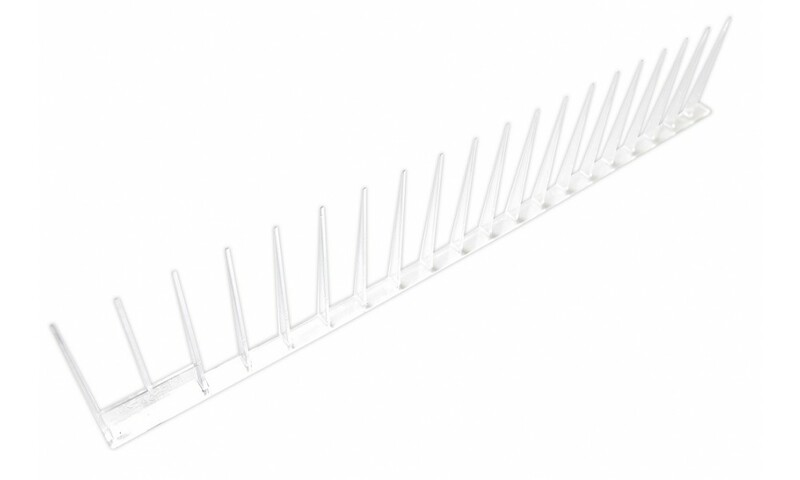 Glue Pest X Spikes in rows 80mm apart for large birds, pigeons and seagulls. Alternatively Bird-B-Gone Polycarbonate Bird Spikes can be used for wide ledges. Pest X Bird Control Spikes keeps your pets in - stops animals & intruders from jumping fences. Stops cats & possums from climbing up trees. 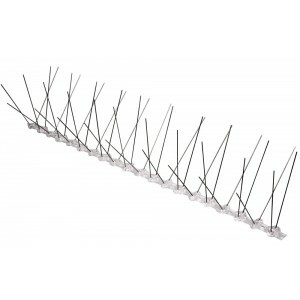 Install Pest X Bird Control Spikes 1.8 metres from the ground. Minimum of 3 rows are needed 90mm apart. Prevents birds from destroying TV aerials and other structures. Cover all possible landing areas with Pest X Spikes.